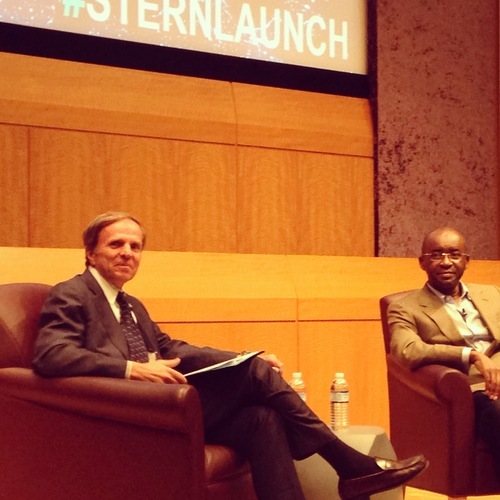 In late August I had the privilege of interviewing Strive Masiyiwa, founder of Econet Wireless as part of NYU Stern's MBA orientation program, LAUNCH. Strive, who describes himself as a social entrepreneur has had an incredible career since 1986, when he began building his business in Zimbabwe. In 1993, as he sought to register Econet as the firstmobile phone company in Zimbabwe, he faced an intense challenge from the Mugabe government, which viewed Econet as a threat to it's own control of the mobile phone industry. Strive launched a legal battle to win the right to launch this business which took five years to wind its way through the courts, a struggle in which he ultimately prevailed. In our interview, Strive reflected on this experience and told the incoming MBA students, "If I had known the challenges I'd face then, I might not have done anything. There's something about being a young person, you don't know the barriers you are going to face, there are so many things that are possible. Just assume that there are no challenges, and just do it." Econet is now one of Africa's largest diversified telecommunications companies, operating in over fifteen markets, and has expanded into mobile banking, insurance, e-commerce, renewable energy and education. Strive uses his business platform to support aspiring African young leaders. "For me, being a social entrepreneur is the business. The business side is just to facilitate, to give me a capacity to respond to some of the things I care about whether it be education, climate change etc." Using his Facebook page, which reaches nearly one million people, he is particularly focused on elevating the status of the African businesswoman, who he believes are the engine for growth in Africa. 'I've been trying to give recognition to some of the most extraordinary women entrepreneurs - to bring out their stories so we can inspire the girl child in Africa to know that she can achieve anything she sets her mind to." In fact, a central component of his business has always had this focus on social entrepreneurship and its role in strengthening the African community: "You can't say, OK I will wait until I have made some money and then I will become a philanthropist - you've got to integrate it into your day job." For example, what began as an informal, personal commitment to fund school fees for children of his employees that had died from HIV/AIDS has expanded dramatically. Strive is setting a wonderful example of how business leaders not only can, but are using the power of business to create value for society.